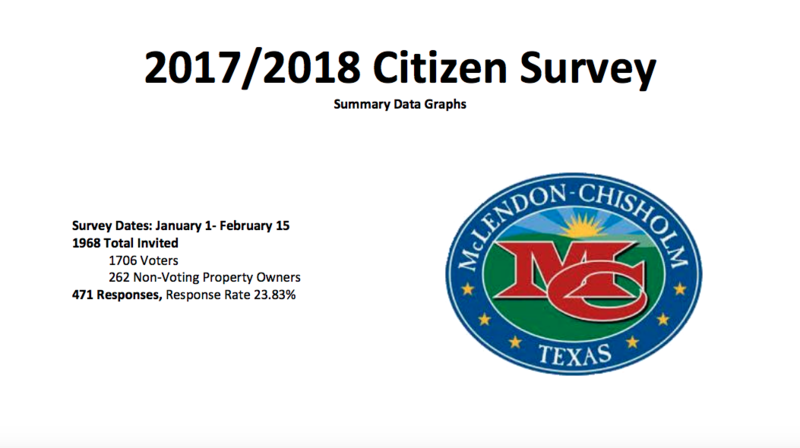 I’m SO excited to announce that you can finally view the graph portion of the Citizen Survey that was conducted earlier this year. The rest of the information will also be published. There is still some minor formatting issues that I noticed. It is what occurs in exporting from the survey program. I’m pretty certain you would get the gist of the question being asked above the graph. If not, please do not hesitate to reach out to the City Secretary to inquire. In the mean time, the formatting of the questions will be cleaned up when we publish the remaining portion. How do you stay informed about City News? Thank you for participating. I’m really grateful with some overwhelming results of where you receive your information from. I will do my best to continue what I am doing with communications. Please do sign up to receive notifications by clicking here. See Page 8. Do you support the proposal presented by Council Member Adrienne Balkum to conduct a feasibility study to determine the future needs for Rescue/EMS services and facilities as the City grows? Thank you for the support of the feasibility study that I proposed. I keep repeating often when I can that I took a chance that the City Council would receive it well or worse. As every day goes by and speaking with a variety of public safety professionals there is no question or doubt that it is absolutely needed. I look forward to our future townhall meeting where all the citizens will be invited to learn of our viable options. See Page 42. Honestly, I am surprised about the results of where Citizens wanted within our city limits future businesses to be located. This is something that I would like to explore more in 2018. Maybe this could be a talking point at the upcoming local business brunch that I am organizing. This is a big deal to me and I hope everyone will give me the grace needed about this sensitive subject to learn more from you. From conversations that I had with City Planners and Managers. One thing was significantly conveyed to me the importance of doing a thorough comprehensive plan and to have the Citizens input of what they want. My hope is to work out something we can review ideas so that we don’t mess up impacting our growing community that it can effect our future. Many citizens who have come from other parts of Texas have come from towns that “used to be” rural areas, but they eventually were developed. I got the impression that it was a negative, because once you develop your open space with concrete. There’s no going back to how it used to be. See Page 19. A few months ago, I was approached about a community event. The activities would involve a 5K and a variety of family friendly activities right here at City Hall. If you are interested in being apart of this will you please contact the City Secretary? I would like to host a meeting to get the ball rolling on this. It is going to take some exceptional people to coordinate and plan for a successful event that everybody will be able to attend. Registrations for the 5K will be a fundraiser for the Veteran Memorial Project. In my opinion, I would like to have a theme event similar to what other cities do with a Balloon Fest, Mud Race, Air Plane Show, Light Shows, etc. What do you think would be something you would like to see be our MC theme? I know in the past the Spring Fests included Cow Patty Bingo. I never played, but I heard many enjoyed it. Even if you won’t take part in the coordinating team. Please send the City Secretary a note of your ideas. There are way too many amazing people in MC that are just waiting for an opportunity to participate.